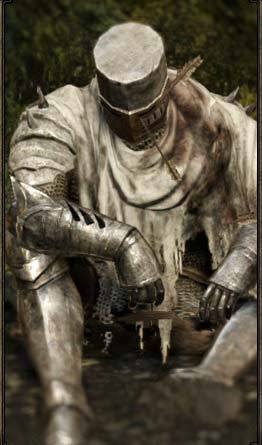 Heide Knights are mysterious knights who don't attack unless provoked. They have several arrows lodged in their bodies. 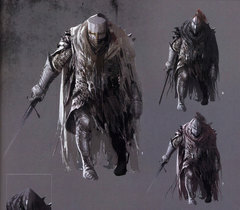 The player encounters three Heide Knights throughout Drangleic, in the Forest of Fallen Giants, The Lost Bastille, and the Shrine of Winter. The weapons they use are made from a special alloy that makes them very durable, but its exact composition remains a mystery. Their armor bears this description: "Whether Heide refers to a kingdom or was just a name for the land is not clear, for no records date back far enough to tell. All that is known is that the Way of Blue has its origins in Heide, and that Heide was later subsumed by the sea." As former Blue Sentinels members, somewhere in their hollowed heads they remember not to attack unless someone has committed sin. Another reason they do not attack on sight is possibly because they are waiting for a final honorable duel. However, they will not engage in combat unless attacked first. Perhaps the arrows protruding from various parts of their bodies indicate a dishonorable demise, and the player serves to put them to rest by the blade. The Heide Knights are descended from the Darkmoon Blades of Anor Londo. They are also the basis for the Blue Sentinel covenant. They were once great knights, but the curse eventually consumes all. Their helmets look exactly like the one Solaire wore, except faded.